Fontana, Calif.- Mayor Acquanetta Warren is featured in CNN's online report titled, "Black women govern only 4% of the biggest US cities. But their numbers are growing." The report focuses on the increasing number of African American female mayors governing some of the largest cities across the nation. View the report. 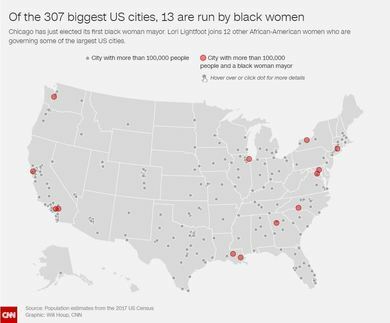 According to the CNN report, there are currently 13 African American females serving as mayors out of the 307 US cities with a population of at least 100,000. The article also notes that in the last two years black female mayors have been elected in such major areas as Atlanta, Charlotte, New Orleans, San Francisco and most recently Chicago. While the report acknowledges that their number is still low at 4%, it has increased in recent years. "As the first female and African American Mayor in Fontana, I stand for inclusion for all those who call Fontana home," states Mayor Warren. "My priority is increasing the quality of life in this great city by creating jobs, educational opportunities, and a wealth of community activities."